The sunrise, of course, doesn’t care if we watch it or not. even if no one bothers to look at it. and couldn’t resist driving down one of my favorite roads in our little community. with a nip in the air and frost on the grass. the steam and fog rose from the ice crystal-kissed earth and cold creeks and ponds. sipping my steaming coffee, but drinking in the beginning of a new day. I wish I took time to notice it more often…. It’s there – just waiting for me to enjoy its beauty. that sunrise just keeps on being beautiful! not Sports Illustrated Swimsuit Edition beauty. in my heart and in my thoughts and in my character and in my actions. even if no one bothers to look. Gene Amole also wrote a book I just bought on Amazon called “The Last Chapter.” I look forward to reading it and will share my thoughts. Jodi, you are the most beautiful person I know- both inside and out! Jodi, you are beautiful! And again – I’m trying to be and you are a role model to me – even I don’t know you in person! 🙂 Hugs! You are so sweet ilze! I promise you I am not always so. But we are all human and we must simply strive to be better and the best we can be. Hugs to Latvia and the camping trip! And ilze. YOU ARE beautiful!!! Perfect, beautiful, beautiful, lovely and inspiring. Lovely post Jodi and so glad you shared it with us. Beautiful words so well composed and so nice to be in the open and be one with nature. 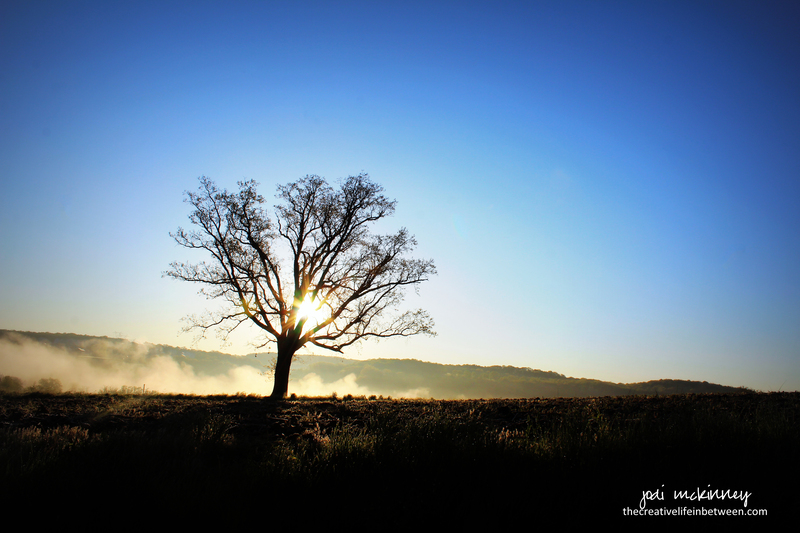 Loved the picture of the solitary tree and even if no one noticed it, it sure stood there. Great post, Jodi. An inspiring post from a beautiful person! Beautifully spoken by a beautiful lady! Jodi, you truly are a beautiful person and I get to see your beauty shine through your posts every day! Oh yes, we all have our moments but you certainly haven’t shown any of those in your wonderful posts! Thank you to you for being such a beautiful blog friend! Gorgeous photo and the words are wonderful Jodi! Oh Jodi, you must truly be an angel! Oh sweet silly kind Jenna . I promise you I am not. But thank you. You are an angel for saying so. Lovely, Jodi, and I agree with so many others – you are an extraordinarily beautiful person! We should always try and adopt the “service to others” role (“to give and not to count the cost..to labor and not to ask for any reward…”). Once we start expecting recognition, our motives come into question. What a sweet thing to say. I am pretty sure I had tears in my eyes writing it last evening. And you are so very beautiful!! At one with nature, the universe and your self. That makes you beautiful and inspiring. Please continue to radiate this strength to all of us. Oh thank you so much Marguerite. I do try to share the good, because not all times are good and I am not always good. But I want to keep striving. Thanks Kerfe! You are beautiful! It’s a beautiful world…even if we don’t always remember it. great post, photo. thank you and you Jodi, are a Treasure. it is, indeed, in the trying, that daily, hourly struggle to overcome our pesky selves in order to do and be what we Really want to be. we try. we fail. we fall. we breathe. we get up again and try all over again. and we don’t stop This Trying to be and do all that we are. Yes, agreed. Beautiful on the inside and beautiful in the actions I take each day. Thanks for sharing. We live in such a “look at me” culture, that we tend to forget that beauty exists, whether we notice it or not. And being beautiful (the kind of beauty you not only described in this post, but also live out so consistently) is something we should all work toward, whether anyone notices or not. Thanks for these words, Jodi…they struck home today!